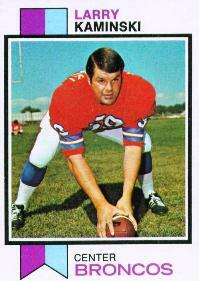 Center Larry Kaminski played for the Denver Broncos from 1966-1973. He blocked for hall of fame running back, Floyd Little, and earned a spot in the 1967 AFL All-Star Game. After retiring from football, Kaminski had an Anheuser-Busch distributorship in Steamboat Springs, Colorado. He took a some time last week to respond to some email interview questions. I recently emailed a single question to some former AFL players. What was the single most exciting moment during your years in the AFL, and what made it so? Two of the responses, I thought, were particularly moving, and mentioned the players parents. So in honor of Father’s Day (a day late), here is the newest installment of Email from the AFL.